Joker is finally here, having been added into Super Smash Bros Ultimate on April 17. Nintendo just released a new trailer too, giving a bunch of details about the masked, gun-toting teen. To help get you up to speed, we've put together this Super Smash Bros Ultimate Guide. We'll look at the various Joker alternate costumes like his Shujin Academy outfit, all Joker's movesets and attacks, how to unlock Joker, and much more. For more on Super Smash Bros Ultimate, you can head over to our Super Smash Bros Ultimate Guides Hub. It's where we've collected all of our Super Smash Bros Ultimate Guides content. From helpful tips and tricks, to detailed character breakdowns, we've got you covered. Joker is the latest fighter to be added to Super Smash Bros. Ultimate, and he's an absolute treat to play. Below, we'll be delving into all his various attacks and abilities, which include being able to summon Arsene, the persona that he starts off with at the beginning of Persona 5. Joker is a really agile fighter, able to cover ground quickly and vault straight over enemies. His neutral special attack on B is his gun, which can be fired continuously by tapping B. His standard attack on A uses his dagger, while pressing down and A will have him perform a sliding attack, excellent for hitting enemies that are just out of reach. His guard on down B can be used to block attacks, while also building up the Arsene meter. Every time Joker takes damage, a gauge above his name on the screen builds up. When this reaches maximum, Arsene is summoned. Arsene will now stay with you until the bar, which gradually decreases, depletes entirely. Arsene boost all Joker's moves, giving his gun and sword attacks a power boost, while letting his guard deflect projectiles. The up B attack uses a grappling hook, which can pull enemies out of the sky above you for some great damage. Alternatively, the grappling hook gives Joker one of the better recoveries in Super Smash Bros. Ultimate. When we first purchased purchase the Fighter Pack 1 or the Fighter Pass for Super Smash Bros. Ultimate, we weren't sure whether you'd actually be tasked with unlocking Joker. Fortunately, the character is given to you from the moment you boot up the game after purchasing the DLC. This means that you don't have to have every other Super Smash Bros. Ultimate character unlocked before you get to Joker. This is welcome news, because this humble guides writer hasn't unlocked nearly half of the 74 other fighters in the game. Thankfully, you'll get the 'Joker joins the fight' screen as soon as you load up Super Smash Bros. Ultimate on your Switch. In the list below, we'll be breaking down all of Joker's alternate costumes in Super Smash Bros. Ultimate. 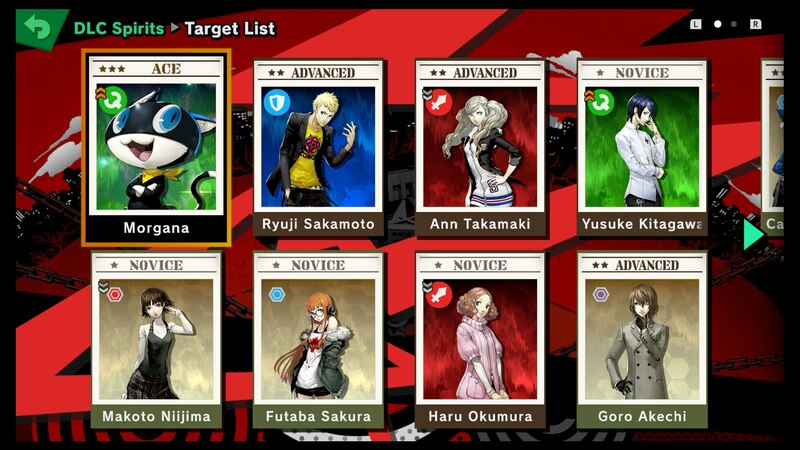 As with the other 74 fighters in the game, you'll automatically have all these alternate costumes unlocked when you purchase Fighter Pack 1 or the Fighter Pass for Smash Bros.
Phantom Thieves - This is Joker's standard Phantom Thief outfit, that he's always kitted out in for the combat sections of Persona 5. Purple - This outfit puts a purple twist on Joker's standard Phantom Thief costume. Blue - This light blue outfit for the standard Phantom Thief gear actually suits Joker's outfit quite well. Yellow - And then there's this yellow twist for Joker's Phantom Thief gear, which doesn't look quite so nice. Red - This color is the common theme for Persona 5, and the Mementos stage for Smash Bros. Ultimate turns red when it plays the Persona 5 battle music, so this color actually suits our leading Phantom Thief. Crow - Now this is a nice surprise. You can kit Joker out in the color palette of none other than Goro Akechi, your main rival and secondary antagonist of Persona 5. 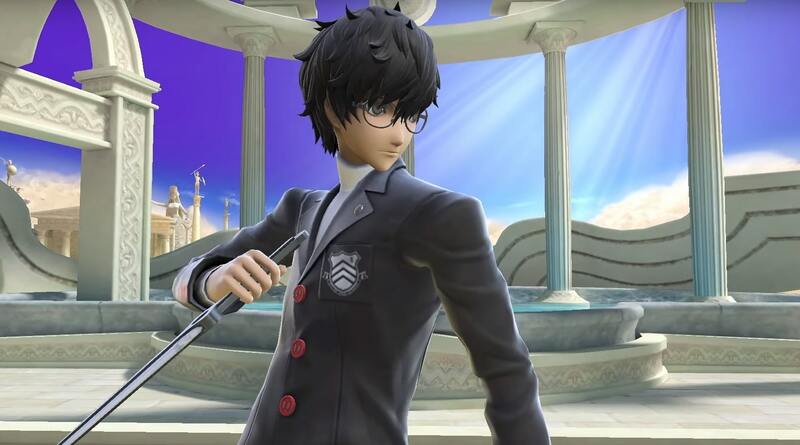 Shujin Academy - If you'd rather Joker went into the battle in his normal school uniform, then you can have him wear his standard Shujin Academy uniform. White Shujin - This outfit turns the Shujin Academy uniform white instead of black, making Joker look a lot smarter, and somehow way older. Nintendo has confirmed that all new Super Smash Bros Ultimate characters will receive an amiibo at some point in the future. That means that eventually, we'll be seeing a Joker amiibo for Super Smash Bros Ultimate. Nintendo is releasing some of the new amiibo early this year, with King K. Rool and Ice Climbers releasing on Feb 15, alongside Piranha Plant. The other new fighters are set to follow some time in 2019. While detailing how DLC packs will be handled for Super Smash Bros Ultimate, Nintendo revealed that each pack will contain a fighter, new songs and a stage. The Persona tracks that come with Joker are pulled from P3, P4, and P5. We've included a list of all 11 tracks below. 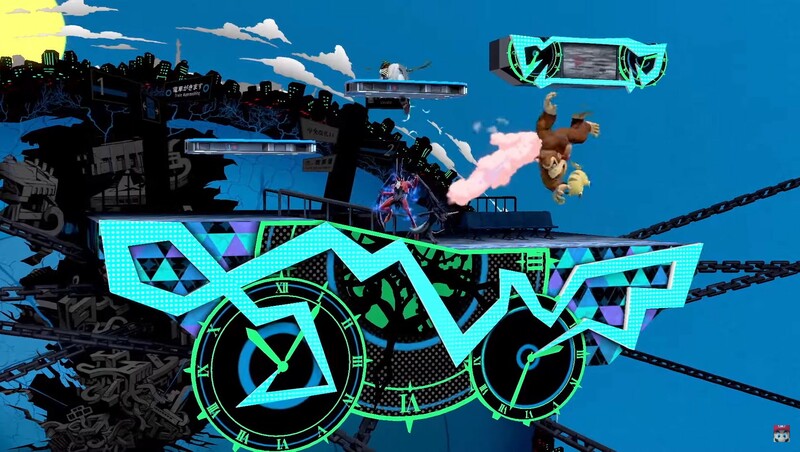 Alongside Joker, and as part of the first Super Smash Bros Ultimate DLC pack, a stage has been added. It's modelled after Mementos from Persona 5, and has the ability to change color depending on which song is playing. If a track from P3 is playing, the Mementos stage will turn Blue. If a P4 track is playing, it will turn yellow. For P5 music, the Mementos stage will be red. The Phantom Thieves will show up after a while, getting off of the Morgana bus to cheer you on. In early April, Best Buy posted a character model of Joker that we hadn't seen before. According to Nintendo Life, this could be the design from Super Smash Bros Ultimate, and might even be the official pose for the Joker amiibo. We'll have to wait and see. Thanks to the video embedded above, we have a good idea as to what Joker's moveset is in Super Smash Bros Ultimate. Keep in mind though, that thanks Rebellion Gauge, many of his attacks have secondary forms. We've listed all of Joker's moves below, with the Rebellion form represented in brackets. 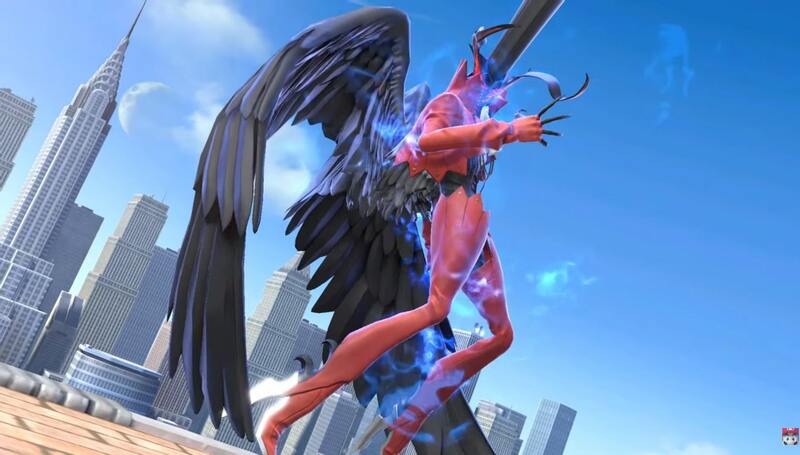 One of the most interesting aspects of Joker in Super Smash Bros Ultimate is that he can summon the Persona Arsene. This adds powerful variants to many of his attacks, adding a three round burst to his gun attack, for example. To summon Arsene, the Rebellion Gauge must be filled. This Gauge automatically builds as Joker takes damage, increasing if he has a high percentage, or if he is at a stock disadvantage. Once it fills up, Arsene is released, and new attacks unlocked. The most powerful from what we've seen so far looks to be the Tetrakarn/Makarakarn counter, which both counters melee, and reflects projectiles. 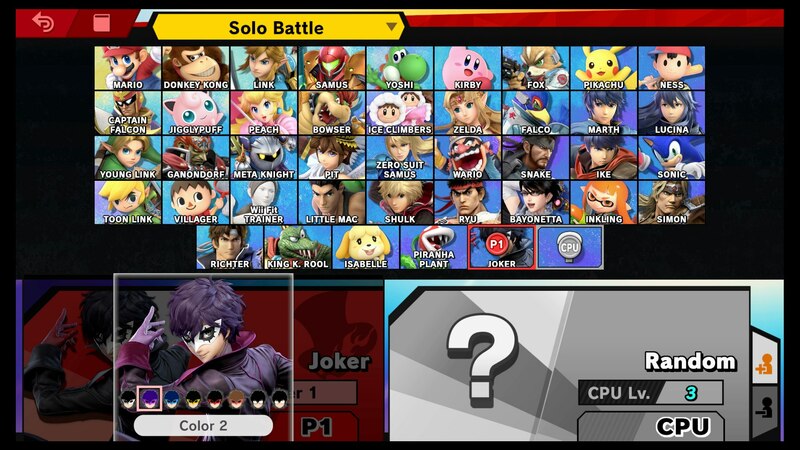 As with all Smash Bros characters, Joker comes packed with a Final Smash. It's called All-Out Attack, and is the same attack featured in Persona 5. 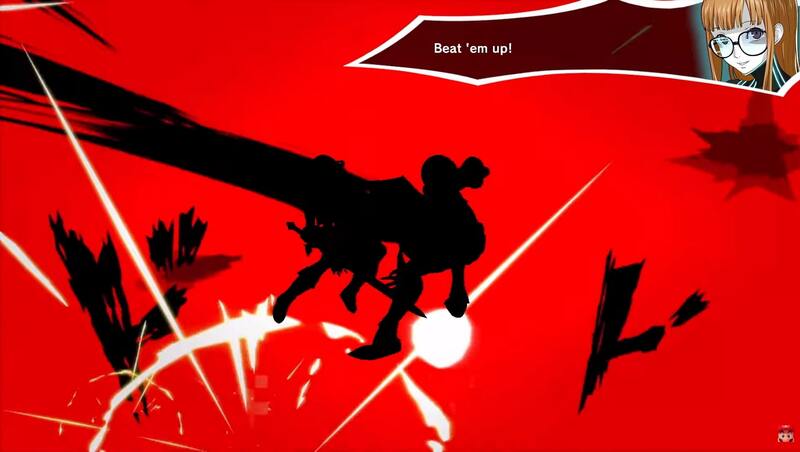 Joker calls upon the Phantom Thieves for a team attack, ending with a stylish kill screen effect. You can check out Joker's Final Smash in the trailer embedded above. Rather fittingly, Joker has some awesome taunts which summon in a beloved character from Persona 5. Morgana is on hand to help you taunt. You can check out some of the Taunts in action in the trailer above. Below, you can find a complete list of all the brand new Persona 5 Spirits that are now available to earn in Super Smash Bros. Ultimate. All of these Spirits can be earned through fights in the 'DLC Spirits' section of the Spirits main menu option. Morgana - Three star Ace. Ryuji - Two star Advanced. Ann - Two star Advanced. Yusuke - One star Novice. Makoto - One star Novice. Futaba - One star Novice. Haru - One star Novice. Akechi - Two star Advanced. Caroline and Justine - Three star Ace. Igor - Three star Ace. Phantom Thieves - Four star Legend. The full Fighters Pass can be picked up for $24.99 in Smash Bros Ultimate. This will give you access to all 5 Challenger Packs, including Joker. If it's just Joker you want, you can pick him up piecemeal for $5.99.